Joe loves playing with water. Loves it. If we let him, he would have the hose run all day long, so he could create rivers, floods, mud, etc. Sunday afternoon, we let the water hose run for an hour. Later in the day, once the boys were in bed, I walked out and gathered the hose. 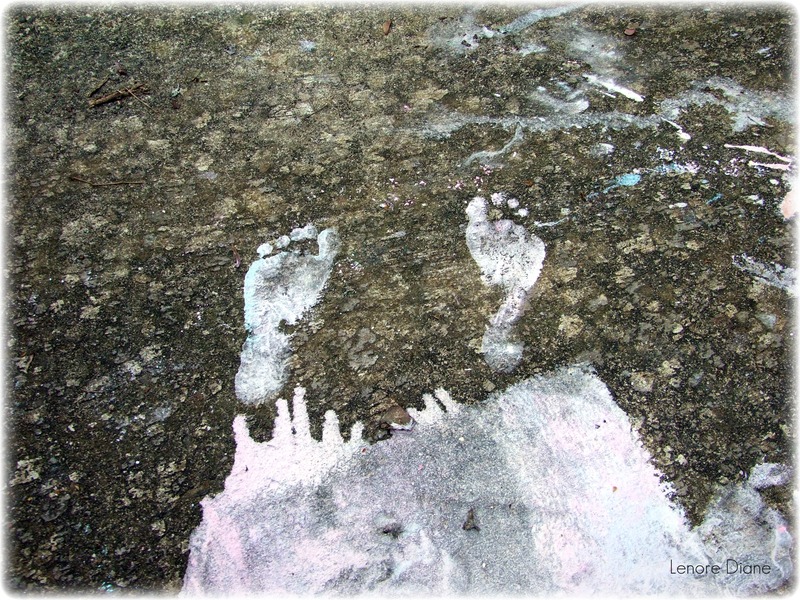 I noticed several pieces of chalk scattered on the driveway and a bucket filled with water and chalk sticks. Based on the artwork left on the driveway, I’m guessing the boys created their own street paint and left their mark. I love these guys. Kinda neat, eh, Mags? Glad you liked it. That is such a cool photo! Kids are incredibly creative when left to their own devices. Glad you liked it, KD. They also made prints of their hands. It was really neat to see their artwork. The best part was the fact they did it all on their own. Very, very cool, Ms. D! Creativity runs in your family, I see! I love the foot prints! Now you will have a picture of thier kiddie feet forever.